The decades-long march of women into the nation’s workplaces may be the most enduring trend in the labor force – and a signature of American progress. But it is also one more reason that Social Security benefits today replace a smaller share of the lifetime earnings of married couples than they did in the past, when far fewer women worked for pay. 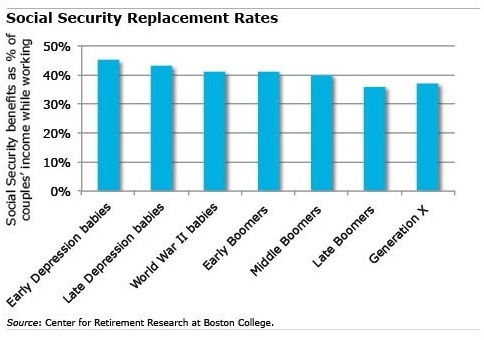 Other reasons include the gradual increase in the age at which U.S. workers can claim their full retirement benefits, from age 65 for the oldest retirees to 67 for Generation X. Medicare premiums are also taking more out of the monthly Social Security check, and more retirees are being taxed on a portion of their benefits over time. But for married couples, the sharp increase in the ranks of working wives has reduced the share of their joint earnings during their working years that is replaced by Social Security when they retire. For the typical couple born in the Depression, Social Security benefits cover 45 percent of their prior earnings, but that falls to 41 percent for baby boomer couples retiring today, according to new research by the Center for Retirement Research, which supports this blog. Bob and Fran Ciaccia could not be happier with their reverse mortgage, which unlocked some of the equity in the house they purchased in 1966 for $12,500. 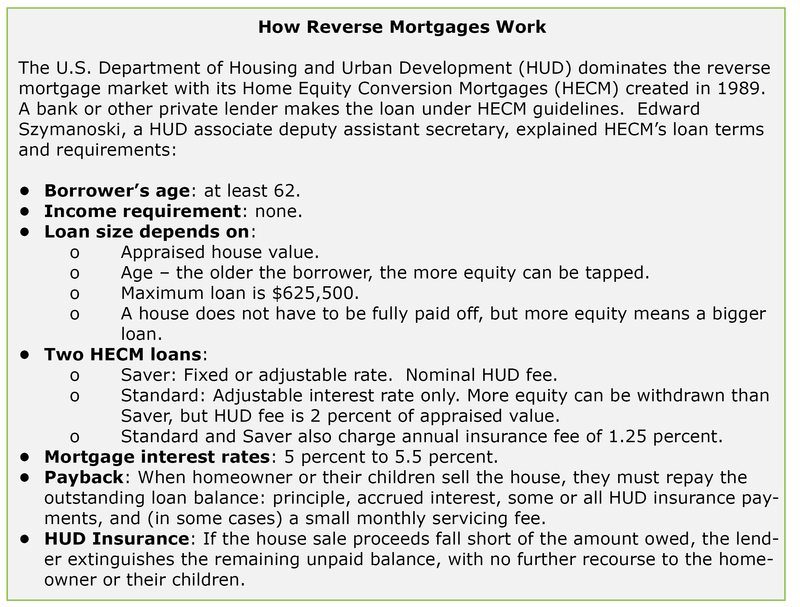 Reverse mortgages are federally insured loans available to U.S. homeowners over age 62. The loan is made against the equity in the house, and the principle, plus interest and some federal insurance fees, are not repaid until the homeowners or their children sell the house. Although the Ciaccias may be big fans, reverse mortgages are unpopular, despite historically low interest rates that make them a good deal for retirees right now. AARP has estimated that only 1 percent of older Americans use them. As we age, the things we forget are at first laughed off as “senior moments.” But when forgetting to send a birthday card becomes forgetting to pay the mortgage, the natural cognitive decline that accompanies aging becomes a serious financial issue. With Americans living longer and an estimated 10,000 baby boomers turning 65 every day, a spate of fresh research has examined how and whether older brains can handle the challenges of modern financial life. But what the researchers have found out so far about the aging mind and money is somewhat of a mixed bag. First, the bad news. Diminished cognition is an increasingly important concern in the financial arena, because the choices faced by retirees are getting ever more complex. One recent survey of people either experiencing cognitive decline themselves or observing it in a family member pinpointed the kinds of financial decisions that older people find difficult. Among those surveyed, 41 percent said they or their family member forgot to pay their bills and 14 percent paid the same bill twice, according to the National Endowment for Financial Education and Harris Interactive. More than one-third had trouble with simple math or made rash purchases. One segment of the U.S. labor force sheds light on the continuing struggle to find work: part-time employees who want a full-time job but can’t find one. The U.S. unemployment rate has drifted down during the economic recovery. 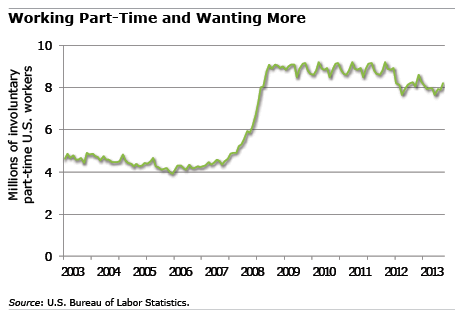 But the number of people the Department of Labor calls “involuntary part-time” roughly doubled during the recession to 8 million and still remains stuck at this much higher level. Packing up and moving across state lines is a time-honored tradition in this country. Settlers headed to the Great Plains in the 1800s, retired snowbirds have flocked to the Sun Belt for decades, and roughnecks today are pouring into North Dakota for the shale-oil boom. But moves like these became extremely difficult for an unprecedented number of Americans after U.S. house prices plunged, suddenly trapping millions of homeowners in houses that were worth less than what they owed on their mortgages. The phenomenon, called “house lock,” was more pervasive during the recent housing market downturn, because the downturn was national in scope – prior housing declines had largely been isolated in regional markets. Retiree Paralysis: Can I Spend My Money? Financial planner J. David Lewis can rattle off stories in his Tennessee drawl about trying to persuade clients to spend their retirement savings – now that they’re retired. One couple wouldn’t tap into a $100,000 account dedicated to the travel they always dreamed they’d do after they stopped working. It took another retired couple well into their 70s before they’d spend a bit of their ample savings on a car – their first new car ever, in fact. What are they afraid of? “That something is going to take it all away from you, or you’re going to run out,” said Lewis, president of Resource Advisory Services in Knoxville. 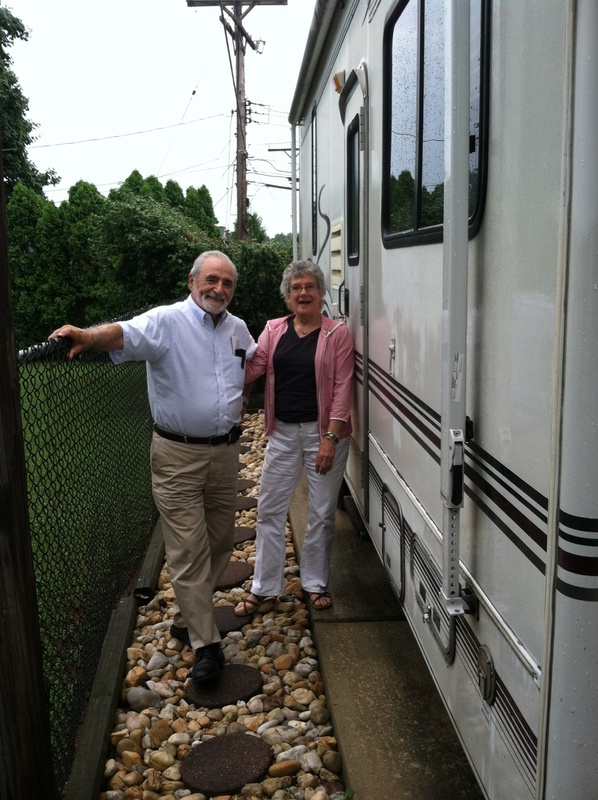 Spending money “is a big bridge to cross” for retirees. By the time people reach their mid-60s, two out of three have retired, either voluntarily or because they’re unable to keep or find a job. By age 75, nine out of ten are out of the labor force. But the minority who do continue working aren’t just survivors – they’re thrivers. Think novelist Toni Morrison, rocker Neil Young, or the older person who still comes into your office every day. The earnings of U.S. workers in their 60s and 70s are rising faster than earnings for people in their prime working years, according to a new study. Defying the stereotype that they’re marking time, today’s older workers are also just as productive as people in their prime working years. Driving these trends is education: far more older Americans now have a college degree than they once did. There’s a “perception that the aged are less healthy, less educated, less up-to-date in their knowledge and more fragile than the young,” but this does “not necessarily describe the people who choose or who are permitted to remain in paid employment at older ages,” Gary Burtless, a senior fellow at the Brookings Institution, concluded in his study.